Faults within a circuit can develop at any time and can be caused by many different factors. Fault testing and diagnosis is a large part of our 24/7 on call/call out service with many customers complaining that they are without certain circuits and some without electricity entirely. 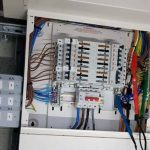 Faults can be caused by a multitude of things, such as water in the circuit, rodents chewing the cables, damage from DIY projects, faulty components such as sockets, fuse boards, dimmer switches or even standard switches. Whatever your electrical fault, do not despair as Electrically Sound can help. We have the latest equipment that is fully calibrated to ensure that all readings are accurate and informative. Our Fluke testing equipment is designed for scenarios like this and it helps to pinpoint the fault in minimal time. Once we know what the fault is we can identify why it is happening and the costs involved to fix it. Call us to discuss your fault and when you need it repaired by. We do not print prices as this really does depend on the time of the call out, distance to travel to the job etc. But all rates are fair and we have not been on a job yet where we are unable to diagnose and offer solutions to any problems.